Middlesex photography graduate Tereza Červeňová has been awarded the John Kobal New Work Award at the prestigious Taylor Wessing Photographic Portrait Prize 2015. 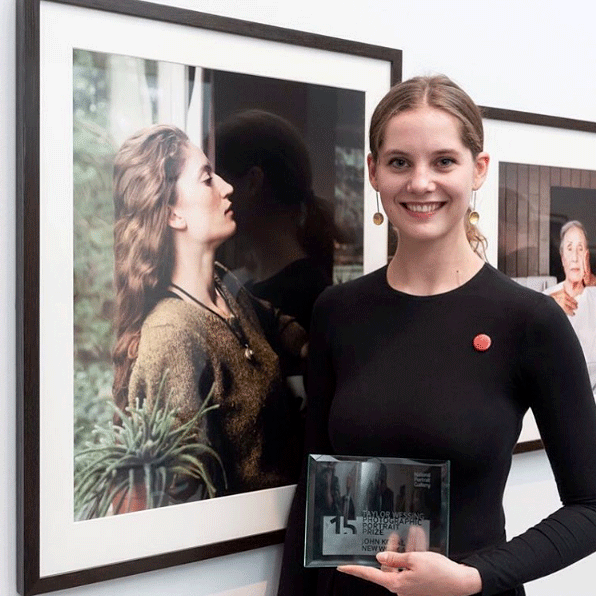 A chance meeting helped Middlesex BA Photography graduate Tereza Červeňová scoop the John Kobal New Work Award at this year's Taylor Wessing Photographic Portrait Prize. Tereza, 24, took the winning photograph of her subject, Yngvild, the day before their mutual friend's wedding in Holland after meeting her for the very first time. The image now appears as part of The Taylor Wessing Photographic Portrait Prize Exhibition, London's leading competition to celebrate the cream of contemporary portrait photography in The National Portrait Gallery, London. It has also been featured on national news websites and in Tube stations across the city. Tereza will receive £5,000 and a commission from the Gallery to photograph someone in the UK film industry. "It is an incredible achievement and wonderfully rewarding to get such an award for my personal work," she said of her win. "A commission by the National Portrait Gallery and the opportunity to have my work in the National Portrait Gallery's Collection is something I would never have thought was possible for me." Tereza first moved to London from Bratislava, Slovakia four years ago to study photography at Middlesex. Now a freelance portrait photographer, working from studios in Dalston and Bermondsey, some of her recent images have featured in The Telegraph, Financial Times and Jazz UK magazines. "I had an incredible time as a student at Middlesex, which I will always value massively," she said. "I got wonderful support from my tutors and high standard photography facilities, which gave me the opportunity to explore the craft of darkroom printing. It let me really explore and develop my work and find the path I want my photography to take." The multi-award winning photographer has been tipped for national success since her second year at Middlesex, when her work was shown in the Taylor Wessing Prize 2013. Tereza was also among the five selected for the first '5 Under 30' photography competition at the Daniel Blau Gallery and in 2014 won a D&AD Yellow Pencil New Blood award for her Family Matters photograph of her younger brother and sister. "Tereza was an outstanding student. She was eager to learn and worked extremely hard. It is gratifying to see her determination rewarded," said Middlesex University's Michael Bradley, Director of Programmes: Communication Arts and joint programme leader, BA Photography.